We’d love your help. Let us know what’s wrong with this preview of Shyness by Philip G. Zimbardo. Dr. Philip G. Zimbardo's ground-breaking studies have found that there are more than 84 million shy people in America today, including such "secretly shy" celebrities as Carol Burnett, Barbara Walters, and Johnny Carson. In this best-selling book, Dr. Zimbardo analyzes shyness with a personal understanding of the emotions involved. He then presents advice, exercises, and e Dr. Philip G. Zimbardo's ground-breaking studies have found that there are more than 84 million shy people in America today, including such "secretly shy" celebrities as Carol Burnett, Barbara Walters, and Johnny Carson. To ask other readers questions about Shyness, please sign up. 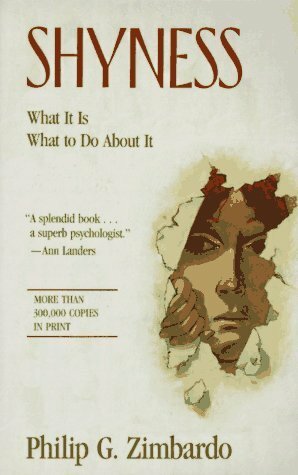 This is an extraordinarily popular book by noted psychologist Philip Zimbardo (of the student "prisoner" experiments and the introductory psychology textbook). I would have given it four or five stars when it first came out. It is still eminently readable as a self-help book but its scientific and theoretical basis is quite dated. Dr. Zimbardo, in the 1970's, developed a questionnaire that he administered to thousands of people worldwide began a self-help program for self-described "shy" student This is an extraordinarily popular book by noted psychologist Philip Zimbardo (of the student "prisoner" experiments and the introductory psychology textbook). I would have given it four or five stars when it first came out. It is still eminently readable as a self-help book but its scientific and theoretical basis is quite dated. Dr. Zimbardo, in the 1970's, developed a questionnaire that he administered to thousands of people worldwide began a self-help program for self-described "shy" students to improve their relations with others. The self-help part of the book is still quite readable and useful; an interesting feature is interviews with celebrities such as Carol Burnett, who said she felt quite "shy" singing a "straight" rather than a "character" song. However, the theoretical parts of this book are mired in 1970's fads such as encounter groups, communal living, and behavior modification. While some benefit might be found in these trends, it is nevetheless true that a behavior found in one-half to one-third of "normal" adult samples is not necessarily a "pathology" that needs "fixing." More troubling is the suggestion that cultural norms in countries such as Japan make them breeding grounds for pathological shyness; such a viewpoint seems ethnocentric. Also lacking in this work are evidence from later studies using genetic mapping and brain scans that have presented a clearer picture of the influences of genes and prenatal and early life experiences in shaping the neural substrate underlying adult differences in temperament and behavior. "Shyness" is still a worthwhile read but needs to be read together with newer works with updated information. This book was priceless for me. I was very shy (I am still a little) and this book helped me very much. This book was a godsend and literally changed my life! I read the earlier version of it back in the '80s. I was painfully shy as a child & teenager. I read the book, did the exercises & followed Zimbardo's recommendations. I was able to deal with my shyness. I won't say I completely overcame it because it seems to lurk in the back of my mind, but I still use the skills I learned whenever I feel shyness getting in the way of my perceptions of myself & my life. Because of this book, I This book was a godsend and literally changed my life! I read the earlier version of it back in the '80s. I was painfully shy as a child & teenager. I read the book, did the exercises & followed Zimbardo's recommendations. I was able to deal with my shyness. I won't say I completely overcame it because it seems to lurk in the back of my mind, but I still use the skills I learned whenever I feel shyness getting in the way of my perceptions of myself & my life. Because of this book, I became interested in psychology which led to a counseling career in the fields of criminal justice, domestic violence & now mental health crisis work. I credit Dr. Zimbardo as one of the people who has transformed my life forever. Even if someone does not suffer from shyness, this book will provide a valuable lesson in human behavior. Слушал в аудиоформате, поэтому заметок не делал. В целом, полезное закрепление имеющихся знаний в области психологии. Не принимать отказ как неприязнь лично к себе, искать причины в другом. Застенчивые люди нарциссичны, чрезмерно сфокусированы на себе, поэтому не слышат многое из того, что говорят им другие. Чаще хвалить, реже ругать, особенно детей. Разделять человека и его поведение, критиковать не человека, а поведение. Активное слушание, задавать вопросы, уточнять. I became tempted to read this book after Dr. Zimbardo connected the prisoner-guard relationship in the Stanford Prison Experiment to the outer-inner self. In Lucifer Effect, he proposed that our subconscious-self may be playing the role of a correctional officer that criticizes us for every private thought, permanently paralyzing us in the time for taking actions and making us obedient to its authority in judgment and decision, which in turn leads to a condition known as shyness! Even though the I became tempted to read this book after Dr. Zimbardo connected the prisoner-guard relationship in the Stanford Prison Experiment to the outer-inner self. In Lucifer Effect, he proposed that our subconscious-self may be playing the role of a correctional officer that criticizes us for every private thought, permanently paralyzing us in the time for taking actions and making us obedient to its authority in judgment and decision, which in turn leads to a condition known as shyness! This book contains the best information to understand and overcome shyness. I think it is a must read for all who suffer from shyness. Po książkę sięgnęłam z polecenia przyjaciela. Autora już znam, więc nie obawiałam się, czy będzie wystarczająco pomocny. Spodziewałam się, że zrozumiem możliwie całe zagadnienie i liczyłam, że będzie sposób dla mnie, żeby radzić sobie z nieśmiałością. Czy było tak? Było. Sposoby są, okazuje się, że część z nich sama można powiedzieć, że praktykowałam i nakładałam na siebie przedtem. Książka otworzyła mi oczy na kilka ważnych aspektów, jakich nie dostrzegałam przedtem, a teraz będę miała na uwadze Po książkę sięgnęłam z polecenia przyjaciela. Autora już znam, więc nie obawiałam się, czy będzie wystarczająco pomocny. Spodziewałam się, że zrozumiem możliwie całe zagadnienie i liczyłam, że będzie sposób dla mnie, żeby radzić sobie z nieśmiałością. Czy było tak? Było. Sposoby są, okazuje się, że część z nich sama można powiedzieć, że praktykowałam i nakładałam na siebie przedtem. Książka otworzyła mi oczy na kilka ważnych aspektów, jakich nie dostrzegałam przedtem, a teraz będę miała na uwadze. Dobrze ukierunkowuje, daje nico do myślenia. Pozostało teraz zwalczyć możliwie nieśmiałość, która uprzykrza mi życie sukcesywnie, ale jestem dobrej myśli i wierzę, że dam radę. Styl pisania jest bardzo przyjemny w odczycie. Książka sama jest wciągająca. Jedynie w moim wydaniu widzę literówki, na co jestem uczulona, ale się tego nie czepiam, bo to nie wpływa na moje oceny zwykle. I think this is the book I read, except I remember the edition having a green background. In common with most self-help books, this book is very good at delineating a problem; not so good with solutions. It doesn't help to tell shy people they've just got to pull up their socks (what socks?) and be more assertive. As with most social conditions, there're the usual number of people who really haven't examined their situation. But most shy people are introspective by nature, and they know very well I think this is the book I read, except I remember the edition having a green background. Мне кажется "застенчивость" не совсем корректное слово, однако, не могу подобрать более приемлемый вариант. Понравилось множество интересных примеров, подкрепленных статистическими данными; неожиданные, порой пугающие истории и их разбор. I had the old version, which was published in 1977. The examples were very dated and used quotes from 70's movie stars. Perhaps the new version would be better. Still, a pretty good book. After reading this, I decided that, for the most part, I quit being shy about 10 years ago. I am going to quit calling myself shy. Wer ist nur für dieses grässliche Cover verantwortlich! Das Buch ist viel mehr ein populärwissenschaftliches Buch zum Thema Schüchternheit als ein reines Selbsthilfebuch. Zimbardo führt hier im Grunde seine Forschung zum Thema Gefangenschaft, die mit dem berühmten Stanford-Experiment nicht begonnen haben und auch nicht endeten, fort. Und nun geht es eben um die Gefangenschaft in sich selbst. I picked this up because I was intrigued by the fact that the man who conducted the infamous Stanford Prison Experiment had written it. Yup shyness is but another form of prison but more importantly I am reminded to work the idiomatic verb phrase "to lay a trip on [someone]" much, much more often. I found this book interesting and I don't regret reading it, however, I think it was more clinically written than I expected, I thought it would be more of a parenting book. Regardless, there were some interesting pieces of information in this book. The book was very helpful for me and my thinking towards people who deal with shyness (a lot of people do). Really interesting how people get shy sometimes. I'm a blushing person, so that's one thing I still need to deal with, but it isn't going to be a problem. Dr. Philip George Zimbardo is an American psychologist and a professor emeritus at Stanford University. He is president of the Heroic Imagination Project. He is known for his Stanford prison study, and authorship of various introductory psychology books and textbooks for college students, including The Lucifer Effect and The Time Paradox.